Here at Shoeboxed, we’ve seen it all. Our Magic Envelopes were designed to be large and sturdy enough to handle even the biggest piles of paper, so it’s no surprise that many of our wonderful customers use them as a catchall for cleaning out their desk or filing cabinet. Whether it’s loose change, candy, a spare sock or random office items like pens or blank post-its– you name it, we’ve probably received it in one of our envelopes. We lovingly call these items unscannables. You may remember a very special unscannable item we received back in 2011 (Hint: it’s illegal, at least here in North Carolina!). We take pride in ensuring that these items make it back to their owners every time (well, besides the above example). 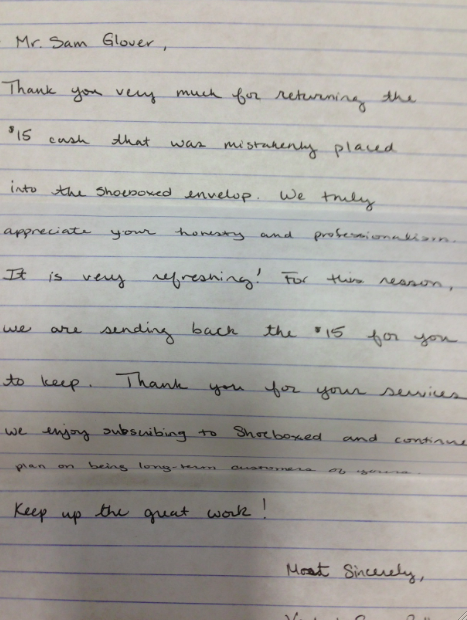 The other day, among the hundreds of Magic Envelopes we received, one envelope came in that included $15 cash. So, we clipped the cash to the envelope and ensured it was sent back to the sender when we finished processing their documents. What we didn’t expect was to have the cash sent back to us! Check out the awesome return letter we received from one of our awesome customers, addressed to our Director of Operations, Sam Glover. The entire Shoeboxed team feels incredibly honored and proud to serve awesome customers like this one. Needless to say, this letter made our day and gave us a new energy and excitement for all of the awesome things we’re working on. We have a lot of neat features coming out in the next few months, so stay tuned, and thank you all for being loyal Shoeboxers! I work as a sorter in operations and I witness all kind of strange things that come in those mail in envelopes. One time someone actually sent a tooth. Not sure why people do that, but it is a pain to have to sort all that since it can’t be scanned.